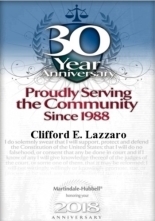 Elizabeth Defense Attorney | Clifford E. Lazzaro, P.C. How Can I Defend My Case? Choose Clifford E. Lazzaro, P.C. Contact Clifford E. Lazzaro, P.C. Have you recently been arrested? If so, it is important to remember every defendant is entitled to aggressive and vigorous legal representation. At Clifford E. Lazzaro, P.C., our goal is to provide top-notch defense for clients accused of serious criminal offenses. Our lead attorney has extensive trial experience and has successfully handled thousands of criminal cases. If you are facing a criminal case and don't want to accept a plea bargain, you have a constitutional right to a trial by jury. While we can work to get your case dismissed prior to trial, we are not afraid to go up against the prosecution team in court. Our Elizabeth criminal defense lawyer can capture the jury's attention from the opening statement to the closing arguments and maximize your chances of acquittal. When You Hire Our Firm, You Will Receive Hard-Hitting Representation, Compassionate Support & Tenacious Advocacy. Our lead attorney has more than 25 years of experience working in law. In addition to criminal law, he is adept at handling all matters of family law and matrimonial law cases. He is admitted to the New Jersey State Bar, the U.S. District Court for the District of New Jersey, and the U.S. Court of Appeals, 3rd Circuit. Lead attorney Clifford E. Lazzaro is a former New Jersey Assistant Prosecutor and a former Special Deputy Attorney General. As such, he obtains a unique understanding of both sides of the courtroom. Our lawyer will anticipate the prosecution’s case against you and build a highly effective defense strategy accordingly. When you hire our Elizabeth criminal defense attorney, you may obtain the upper hand in court. Clifford E. Lazzaro will work to draw the jury's attention to the weaknesses of the State's case. He will build a strong case that proves the State's inability to meet its burden of proof of guilt beyond a reasonable doubt. He utilizes unrelenting techniques when taking cases to trial and will do everything in his power to protect and defend your rights. We've Handled Thousands Of Criminal Cases. Put Our Top-Rated & Highly Successful Attorney In Your Corner. We Will Help You Defend Your Rights & Protect Your Future. Our Attorney Will Walk With You Every Step Of The Way. After Being Arrested, It Is Vital You Retain The Representation Of Our Attorney. Get Started With A Risk-Free Case Review. Do not sit back & wait for your charges to blow over. Call (908) 527-1000 to reach our top-rated & dedicated legal advocate. We can ensure your voice is heard & your rights are properly represented. Contact Our Elizabeth Criminal Defense Attorney at Clifford E. Lazzaro, P.C. Today!